By Nancy Young in WordPress. Updated on September 19, 2016 . The sidebar is an additional area on the site, where you may place information for your visitors. You might use the sidebar to navigate a site, advertise something, as a way to gain new subscribers and followers, showcase or highlight specific content. As practice shows, left sidebars gain more attention: we look through the page and read from left to right, so everything on the left falls to our eyes first. 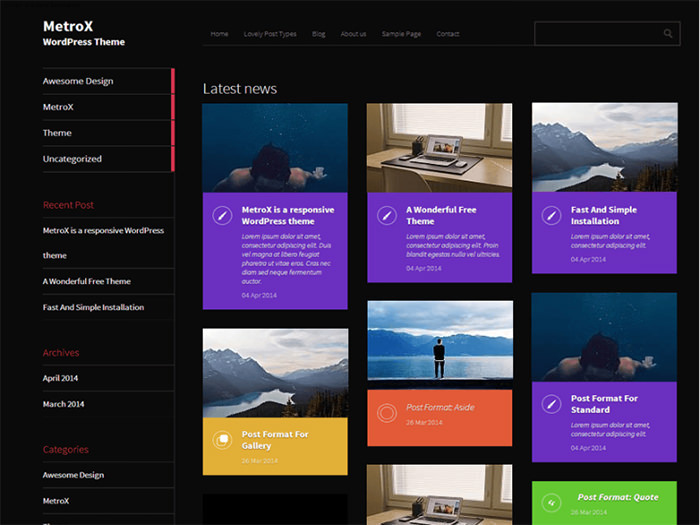 If you’re looking for a new WordPress Theme for your future site, here we collected 20 WordPress themes with left sidebars in both the free and premium categories. 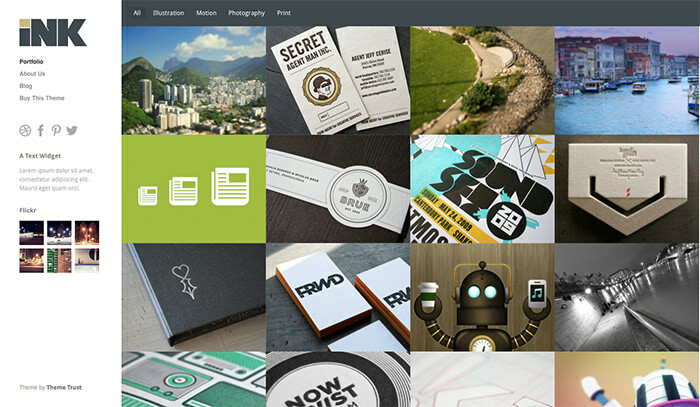 Gridster is a grid-based portfolio theme for designers, artists and other creatives who need to showcase their work online. It’s fully responsive and mobile-ready. 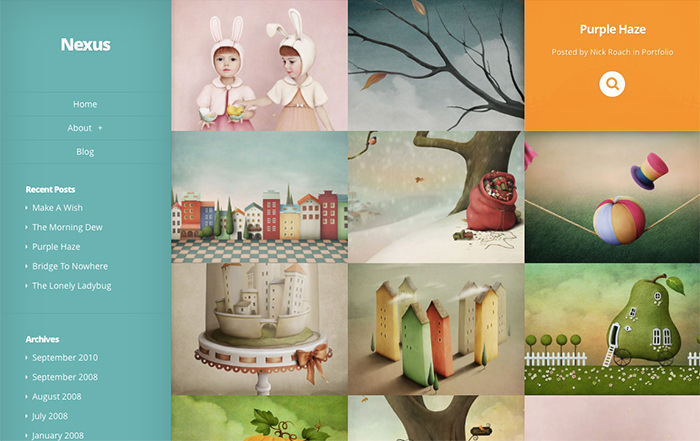 This theme features card design which became extremely popular with Pinterest. Each card includes an image preview and a brief description for it. So, the theme could be used for showcasing any products or services. 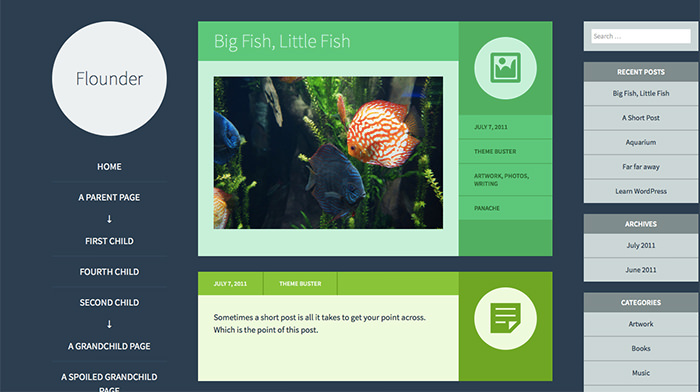 Flounder is a creative theme for bloggers with colorful blocks for various types of content. It’s flat and minimalistic to fit in any type of purpose. Oxygen theme looks really airy and light thanks to its white background color. It works best for blog or a magazine site. Dark background, card design and vivid color scheme makes this theme super creative and modern. It features responsive design and it’s easy to customize. 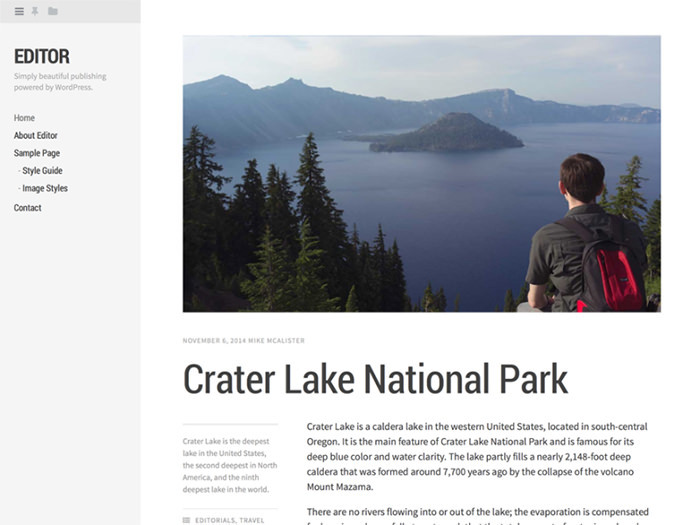 This theme with left sidebar for site navigation and bold typography is a great choice for editorials. This theme with playful vivid design would be suitable for teaching, food, jewelry, DIY products, or housekeeping. 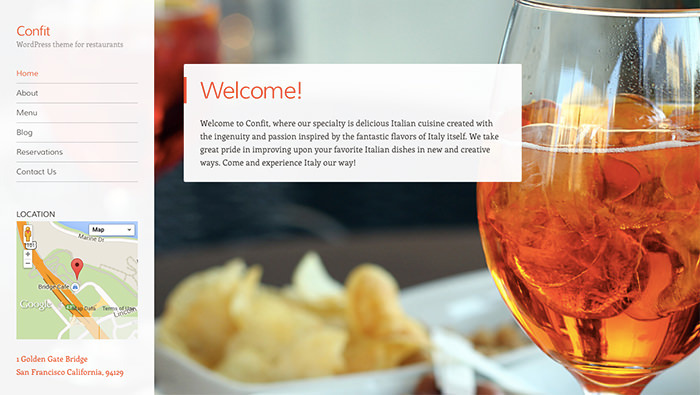 This theme is a perfect fit for a cafe or a restaurant. It also features a map, so people could easily find your location. Connecting to OpenTable will allow your clients make reservations. 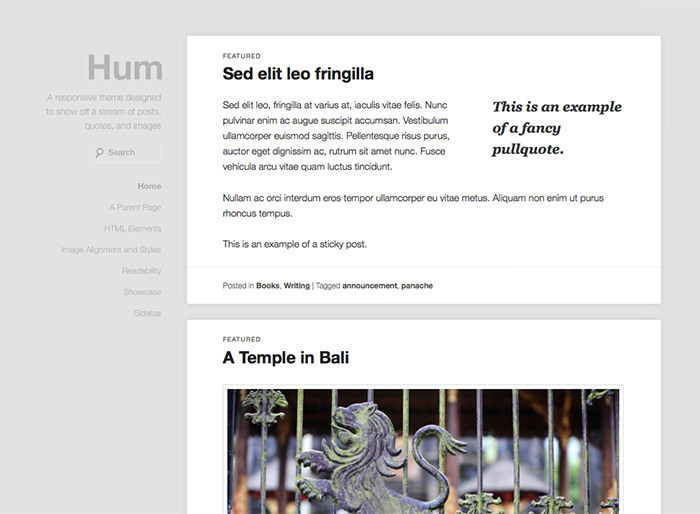 Hum offers multiple post formats for bloggers to share links, quotes and images. 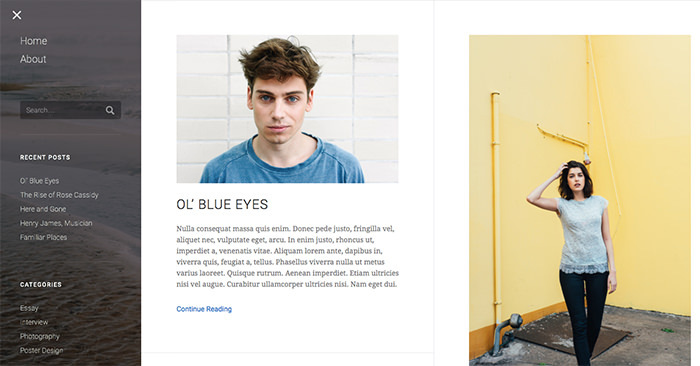 Twenty Fifteen is a simple minimalistic theme for bloggers with focus on content. It has five free color schemes to completely change the way your blog looks. Oslo fits for a blog or portfolio site. 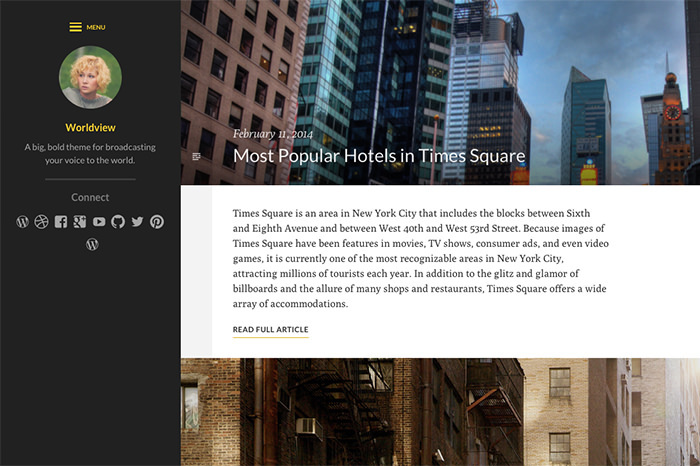 It has two-columns responsive layout and customizable sidebar. Also, you can place any image in sidebar and change the title on your logo. [$79]. 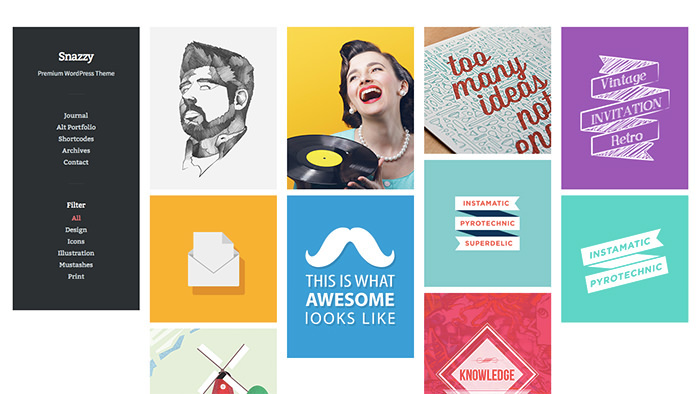 Snazzy is a clean theme for showcasing your work online. It’s 100% responsive and Retina-ready, so the site built with this theme will look stunning on any device. [$48]. Ink is a clean, elegant portfolio theme. It allows you to set up a background for any post or page to give it a more personal touch. [$59]. 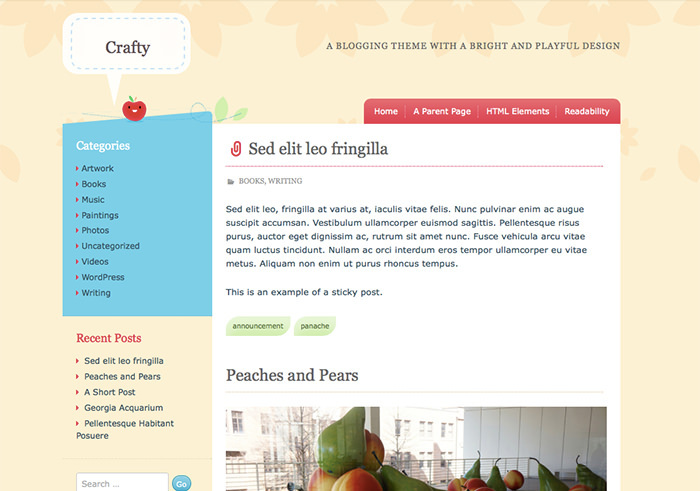 This responsive theme for bloggers with unique typography will let your content shine. You may change the color palette of the sidebar, add huge feature images to every post, and customize almost any element of the theme. [$75]. 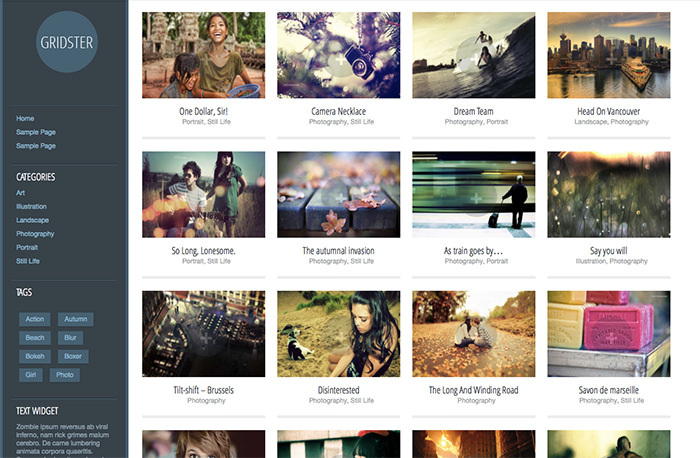 Gridspace is a minimalistic theme made by photographers for photographers. 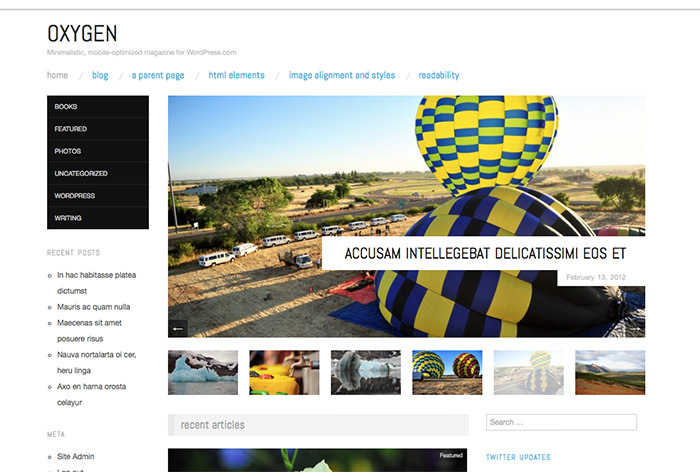 You can change the color scheme and add any header image you want to customize your site. And it’s also responsive. [$75]. 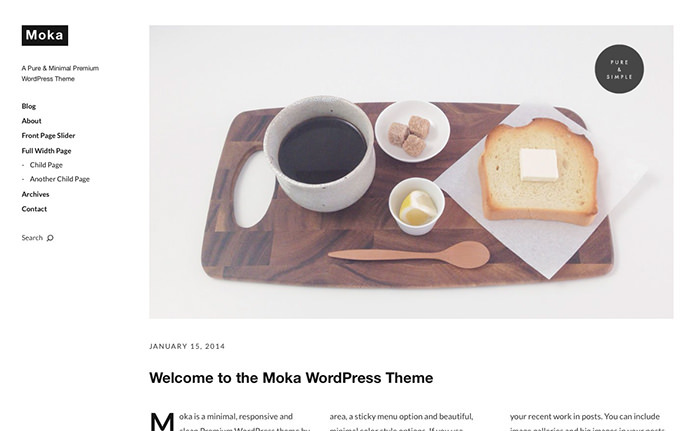 Moka is a minimalist blog or magazine theme. 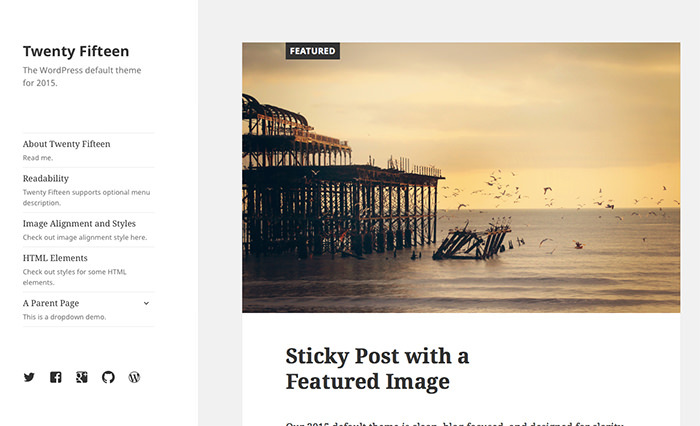 You can choose your own front page: it can be a sticky big post or a featured blog slider. [$18]. 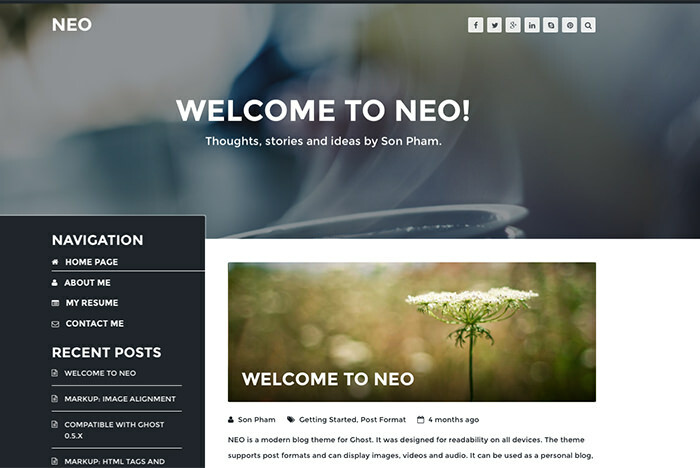 A "modern blog theme" for Ghost, Neo comes with the ability to display images, videos and audios. You can fully customize it to fit your style and purposes. [$19]. 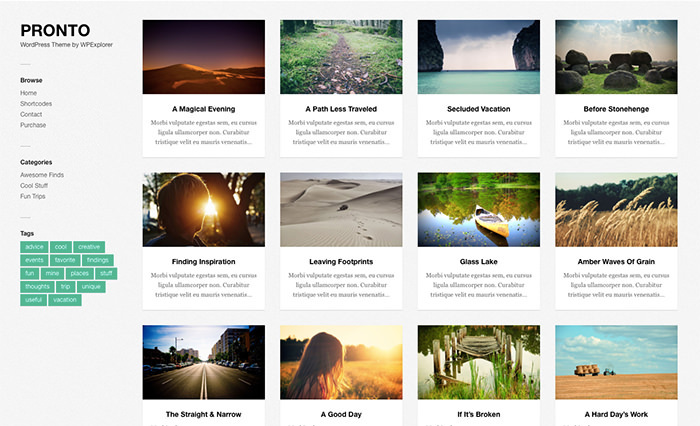 Nexus is a beautiful grid-based theme created for visual storytelling. 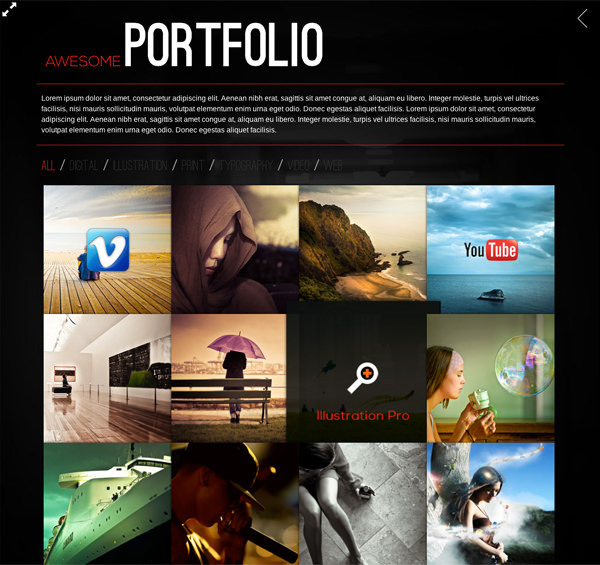 The theme is interactive and responsive to fit in any screen resolution, not saying about many customization features. [$68]. 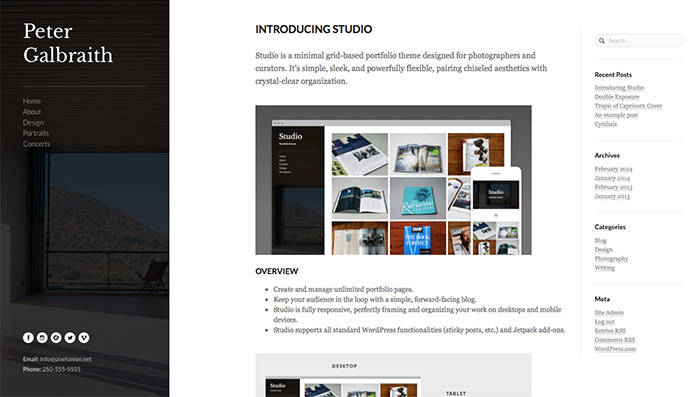 Studio is a sleek, stylish and elegant theme for photographers. 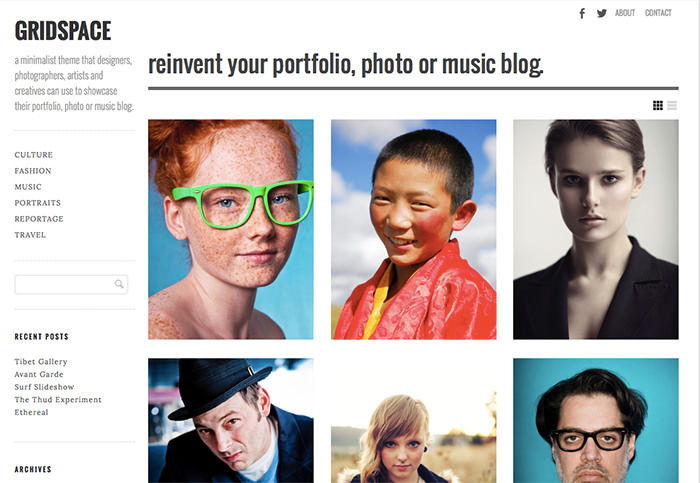 You can create unlimited portfolio pages and fill it with content to showcase your work. [$79]. 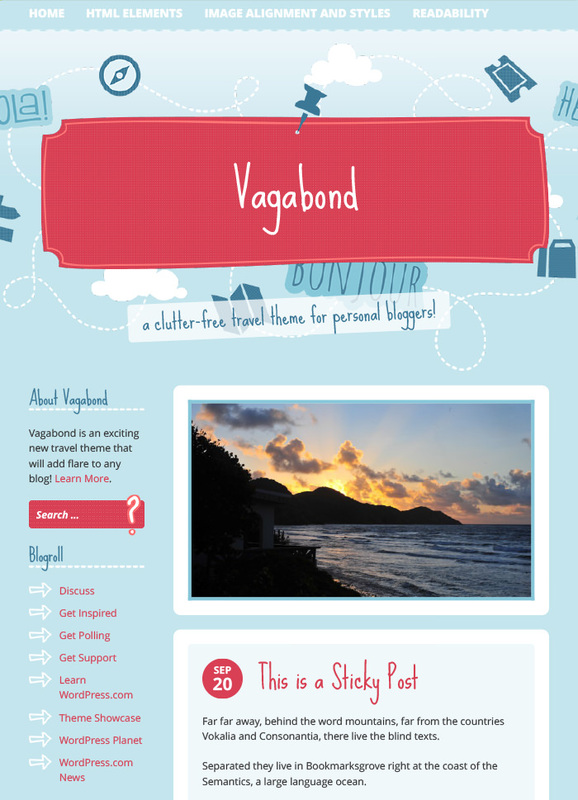 Vagabond is playful colorful blogging theme for travellers. It will frame any post you share into a stunning story. [ $75].